A new optical instrument that can detect plant-based organisms from kilometres away due to the unique way living things reflect light could one day help in the search for life beyond this planet, new research suggests. The working prototype device – called the TreePol spectropolarimeter – is the result of years of research by Dutch biologist Lucas Patty from Vrije Universiteit Amsterdam. If his wild vision comes true, circularly polarised light could ultimately help us to detect extraterrestrial life. In a new paper and PhD dissertation, Patty describes how the phenomenon of chirality (or molecular handedness) in biological systems affects the way they reflect light, resulting in fractional circular polarisation of light, which "constitutes an unambiguous biosignature". Research into these kinds of biomarkers, which Patty has conducted since 2015, started off with instruments that could detect the rotation of reflected light off leaves in the lab, including ivy and ficus. Taking the research one step further, he tried the TreePol spectropolarimeter outside, placing the device on a rooftop, and seeing if it could detect the grass on the nearby university football field. To his surprise, there was no signal, but it turns out that didn`t mean the instrument wasn`t working. "I went over to investigate, and it turned out that the team play on artificial grass!" Patty explains. Because artificial grass isn`t living and so doesn`t exhibit homochirality (which means that all molcules should have the same handedness) at the molecular level, it doesn`t produce the signal the TreePol spectropolarimeter is looking for, much as dead vegetation also doesn`t. Living trees and grass do work, however, and in Patty`s testing, the device can successfully identify the signal of circularly polarised light from up to several kilometres away. It sounds a bit crazy, but scientists investigating the remote sensing of life have developed similar kinds of systems before. According to Patty, this kind of technique could one day help researchers do things like monitor agricultural crops from aircraft or satellites, but going even further, the sky`s the limit. "In the context of astrobiology, the circular polarisation of biomolecules is a powerful biosignature," Patty and fellow researchers explain in a new paper, which hasn`t yet been peer-reviewed, but has been submitted to the journal Astrobiology. "Compared to other surface biosignatures there are no significant signals produced by abiotic matter, and therefore no false positives." 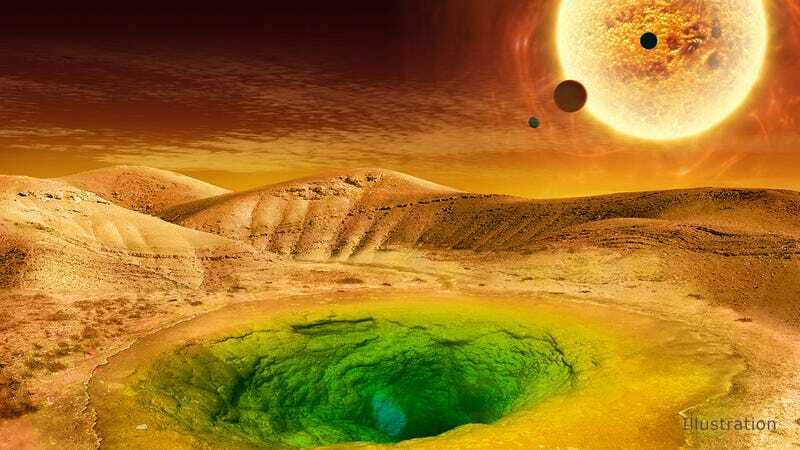 There`s a lot more work to be done to refine the technology and enhance its capabilities, but in principle, the researchers think this could be an important milestone in astrobiological science. "Our results underline the potential significance of circular polarisation both as a remotely accessible means of detecting the presence of extraterrestrial life, and as a valuable remotely applicable tool for vegetation monitoring on Earth," the team explains. "An important next step will be to use these results in exoplanetary models with realistic components such as different surfaces and clouds, while future field and laboratory studies should continue to explore the versatility and potential of this technique." A summary of Patty`s research along with the complete dissertation are available here, and the team`s latest paper can be found at arXiv.org.